Ilha de Moçambique is an idyllic island for visitors; it was once the capital of Mozambique and is now a world heritage site. But for the local population as well as for visitors, there is a threat that darkens the picture: the risk of getting malaria, a potentially deadly disease that remains the main cause of health problems in Mozambique. Castélio Muwasse, a Field Officer for Malaria Consortium, works in the District of Ilha de Moçambique. This 31-year old technician in preventive medicine and environmental sanitation joined the Malaria Prevention and Control Project team in 2016, motivated by the desire to work with communities and learn new experiences. As a field officer, the responsibilities of Castélio included support for the District Health Services in the implementation of project activities, training of community structures and teachers on malaria prevention, collection and compilation of activity monitoring data, and coordination between health facilities and community structures, such as health committees and local organisations, and between district education and health services. In addition to mobilising community structures for malaria prevention, he coordinated the training of teachers with the school health technician of the District Education Services. Castelio is based at the District Health Services office, but actually spends a lot of time traveling on his motorcycle to reach the various communities and health facilities scattered throughout the district, even the most remote ones. With this knowledge of the terrain, he is able to draw a detailed map of the district in just a few minutes. In order to work effectively with community structures, it is essential to build a trusting relationship. Castélio joined Malaria Consortium to replace a field officer who had worked with these communities for a few years so he had to use all his interpersonal communication skills to gain the trust of the volunteers. Castélio says that the communication activities for behaviour change carried out by community structures volunteers, teachers and students have contributed to the reduction of malaria cases, partly as a result of their collaboration. This is certainly the most rewarding part of being a field officer on the ground. This type of work also offers many learning opportunities for young professionals, such as Castélio, to grow. The Malaria Prevention and Control Project has been implemented in nine of the 11 provinces of Mozambique by a consortium of civil society organisations led by World Vision, with Malaria Consortium, Community Development Foundation and Food for The Hungry. Malaria Consortium carried out interventions in 17 districts of the province of Nampula and six districts in Niassa. 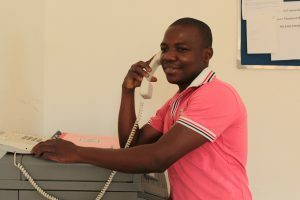 Castélio Muwasse is one of the 23 field officers who worked with Malaria Consortium to implement communication activities to change behaviours at the community level.